From Ishigaki to Okinawa, people are beginning to hum the tune ‘take me out to the ballgame’ as spring training rolls toward the first exhibition games less than a month from now. Baseball fans have something to look forward to as Japanese pro-baseball teams hold their spring training camps here. Yomiuri Giants, the most storied of Japanese pro teams will take on Hiroshima Toyo Carp on Feb. 21 and on Rakuten Eagles on Feb. 22 at the Cellular Stadium in Onoyama Sports Park in Naha, tickets are available at FamilyMart convenience stores. Thirteen professional baseball teams, including four from Korea, will begin going through spring training paces on Okinawa Feb. 1st, preparing for a baseball season that officially launches in March. Aside from players, coaches and managers, many of the mainland Japanese teams have loyal fans that have flocked to the training sites to mix-and-mingle with their favorite stars, not to mention hordes of media reporters who follow every move of their assigned teams and players. Urasoe City is hosting the Yakult Swallows, while the DeNa Yokohama Bay Stars are in Ginowan and the Chunichi Dragons and its farm team in Chatan. The Hiroshima Carp are working out in Okinawa City, the Hanshin Tigers in Ginoza, and the Hokkaido Nippon Ham Fighters are in Nago. The Chiba Lotte Mariners are in Ishigaki, the Rakuten Golden Eagles and its farm team are both on Kume Island, and the Shonan Searex, a Yokohama Bay Stars farm team, is in Kadena Town. Four Japanese professional teams—the Orix Buffaloes, Yomiuri Giants, Seibu Lions and Softbank—have opened spring training camps in locations other than Okinawa. The Orix Buffaloes in past years had spring training drills on Miyako Island. Training was moved from Miyako Island to Miyazaki Prefecture last August 25th. According to Ryuzo Setoyama, the general manager of the team, there are three reasons; a better facility, easiness of adjustment of schedules of practice games and attracting a larger number of fans. Orix had a camp on Miyako Island since 1993. “We so much appreciated Miyako Island for supporting us,’ said the general manager Setoyama in Osaka.The new camp site, Miyazaki Kiyotake Comprehensive Athletic Park, has a 5,500 capacity stadium and an indoor ground. They have constructed another stadium the same size as current one and a bull pen that ten people can practice in at a time. The Yomiuri Giants and Fukuoka SoftBank Hawks are also training in Miyazaki City, although the Giants spend the latter half of February at Cellular Stadium in Naha. Korean teams are soaking up Okinawa’s warmth as temperatures across the southern Korea peninsula are in the sub-zero range. The LG Twins are in Ishikawa, Uruma City, the SK Wyverns are in Gushikawa, Uruma City, The Samsung Lions are working out at Guam now, and will then open its second training camp on Okinawa. The Kia Tigers are training exclusively on Okinawa, while five other Korean pro teams – the Nexen Heroes, NC Dinos, LG Twins, Doosan Bears and Lotte Giants—will train in Arizona. Youngsters of all ages with aspirations of playing professional baseball are gathering daily at the training sites, hoping for a word, or a tip, or even a smile from the pro players. In the intimate Okinawa training setting, players often take their bento or noodles and sit in the stands during breaks, mixing and mingling with spectators. The opening exhibition game is February 21st with the Yomiuri Giants and the squaring off against Hiroshima Toyo Carp at 1 p.m. at Cellular Stadium in Naha City. The Hanshin Tigers and DeNa Yokohama Bay Stars meet at 1 p.m. at Ginowan Baseball Stadium near the Convention Center. 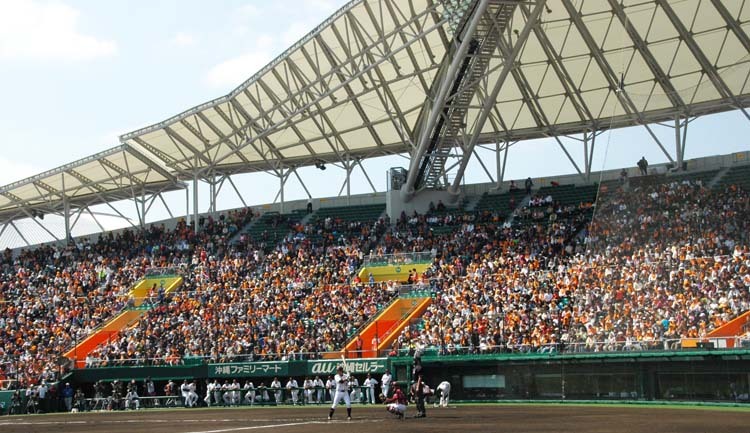 On February 22nd the Giants take on the Rakuten Eagles at Cellular Stadium at 1 p.m., while the Tigers go against the Chunichi Dragons at Chatan Stadium at 1 p.m. A third game, also at 1 p.m., puts the Yakult Swallows against the Nippon Ham Fighters at the Urasoe Stadium. Baseball’s been a big business here in Japan since 1872, when Horace Wilson introduced the game to Tokyo audiences. Professional leagues were begun in 1934. The professional circuit is divided into two six-team leagues, the Central League with the Yomiuri Giants, Hiroshima Carp, Hanshin Tigers, Chunichi Dragons, Yokohama DeNA Bay Stars and Tokyo Yakult Swallows. The Pacific League is comprised of the Tohoku Rakuten Golden Eagles, the Orix Buffaloes, Chiba Lotte Marines, Hokkaido Nippon Ham Fighters, Saitama Seibu Lions and Fukuoka SoftBank Hawks.